Lothar Erdmann, Berlin, by 1913. Acquired from the above by the father of the present owners on 3 May 1956. G. Vriesen, August Macke, Stuttgart, 1953, no. 169, p. 276. G. Vriesen, August Macke, Stuttgart, 1957, no. 169, p. 317 (illustrated). U. Heiderich, August Macke, Gemälde, Werkverzeichnis, Ostfildern, 2008, no. 259, p. 378 (illustrated p. 379). Münster, Westfälisches Landes museum für Kunst und Kulturgeschichte, August Macke, Retrospektivezum 100. Geburtstag, February 1987. In the fall of 1909 August Macke settled in a small hamlet on the shores of Lake Tegernsee in the German Alps and painted there for a year. He and his young wife Elizabeth, who was pregnant with their first child, were coming directly from Paris, where the couple had spent their honeymoon. For Macke it had not been his first visit to Paris, and he had fallen deeply in love with the City of Lights, where he considered “the whole world to be in one spot”. During these weeks in Paris Macke took in as much art as possible. He visited art museums and private collections, particularly eager to study the paintings of the Barbizon school, the French Impressionists and Post-Impressionists. He also attended the Salon d’Automne, where he was deeply impressed by the works by the Fauves –especially Camoin, de Vlaminck, Manguin, Marquet and Matisse‒as well as the Futurists – Balla, Boccioni and Severini. Twenty-three years old at the time, Macke seriously considered Paris as his base, and started looking for studio space in Montparnasse. But the high cost of big city living and complications with Elizabeth’s pregnancy eventually convinced the couple to take another, less glamorous option. In his letters Macke’s friend, the writer Wilhelm Schmidtbonn,was full of praise for Tegernsee`s magnificent lake and mountain scenery, its mild climate and simple, beautiful people. He urged August and Elizabeth to join him there, and eventually,on 27 October 1909, the couple boarded a train to Southern Bavaria. Tegernsee‘s vicinity to Munich repeatedly brought Macke to the city, where he visited exhibitions by the art dealers Brakl and Thannhauser, who specialized in French Impressionist and Post-Impressionist painting and contemporary German art. In January of 1910, Macke discovered lithographs at Brakl’s that deeply moved him. He inquired about the artist and decided to pay him a visit right away. The producer of these lithographs was Franz Marc, and the men’s first encounter turned out to be the start of a close, life-long friendship. “I think it is a real stroke of luck to finally meet a colleague with such insightful artistic attitude, ‒ rarissime! How happy I’d be, if we could manage to exhibit our pictures side by side one day. Throughout the following year Marc and his fiancé Maria Frank frequently visited the Mackes at Tegernsee. 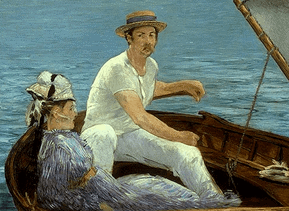 Both men deeply respected each other’s talent and engaged in endless discussions about the function of painting and particularly the significance of colour. They enjoyed working side by side, and occasionally engaged in playful painting competitions, like the one, that produced the famous portrait of Franz Marc by Macke, owned today by the Nationalgalerie, Berlin. August Macke`s body of work from Tegernsee about 200 paintings shows obvious stylistic influences by the French art he had so deeply admired in Paris. Macke’sSegelboot, Tegernsee of 1910, for example, unmistakably cites compositional elements of Manet’s famous painting Boating (National Gallery, Washington D.C.), while using the vibrant colours and simplified shapes of Fauvism. 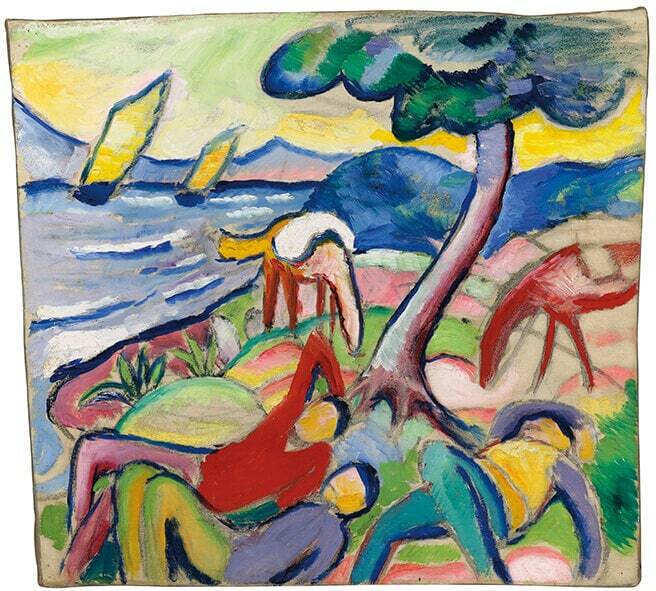 The present painting Sleeping Riders is executed in the Fauves spirit, with radiant colours, fluid lines and reduced detail.It depicts three figures resting under a tree on the windswept shores of Lake Tegernsee – an idyllic scene of joyful and carefree relaxation. 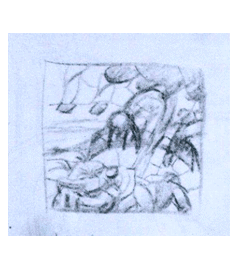 Even the irregular shaped canvas reflects the artist`s light-hearted attitude.A drawing in purple coloured pencil on p.12 of Macke’s sketchbook no.34 outlines the composition for the work in oil. Until his premature death in 1914 ‒he was killed in action during World War I at age 27 ‒Macke’s approach to painting remained worldlier than Marc’s and Kandinsky’s. Macke’s intention was to depict the beauty of the visible world, focusing on the emotive quality of colour and harmony of form, rather than the spiritual in art. Sleeping Riders was acquired by Lothar Erdmann in 1913, who was not only a close friend of August Macke, but also married his widow in 1916, after Macke was shot on the Western Front during the first weeks of WWI. Erdmann, a Socialist, died in the concentration camp of Sachsenhausen in 1939. Elisabeth Erdmann-Macke took care of her first husband’s body of work until her death in 1978, and successfully protected it from Nazi destruction during WWII, when Macke’s art was regarded “degenerate”. 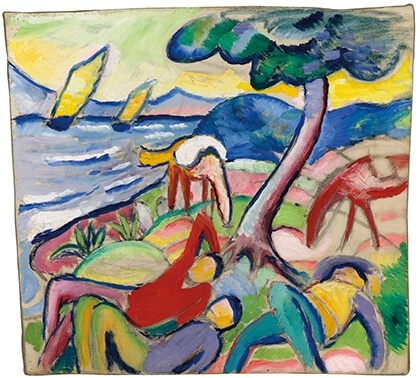 The present painting likely remained in her possession until it was sold to Cologne art dealer Aenne Abels in the 1950s. 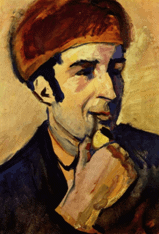 Franz Marc in a letter to Macke, January/February 1910, in: August Macke, Retrospektivezum 100. Geburtstag, exh.cat. Münster, Westfälisches Landes museum fürKunst und Kulturgeschichte, February 1987, p.161. Macke in a letter to Sofie Gerhardt, 10 Oct. 1910, in: August Macke, Retrospektivezum 100. Geburtstag, exh.cat. Münster, Westfälisches Landes museum für Kunst und Kulturgeschichte, February 1987, p.161. Franz Marc: Eulogy to Macke, October 1914, Manuscript, Germanisches National museum, Nuremberg, Germany.